The mincemeat that we made back in October is maturing nicely, and quite frankly we’ve held off long enough. Now December is upon us, we’ll be unleashing glorious mince pies on you every day in the bakery. We have a deliciously rich mincemeat, which will be stuffed into our own sweet shortcrust pastry and baked fresh daily. 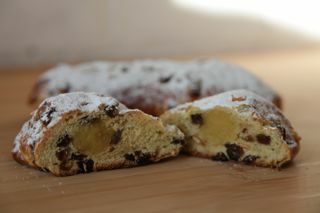 PRE-ORDER STOLLEN – This year reserve your Christmas Stollen (for collection in the shop on 23 – 24 December only). We do not offer a postal service. Our usual selection of bread produced in the Loaf Community Bakery will also be available to buy as usual in the Stirchley Stores co-operative community shop. CHRISTMAS OPENING HOURS – The Loaf Community Bakery, Cookery School and Stirchley Stores will be closed from Wednesday 25th December, re-opening on Thursday 2nd January 2014. STIRCHLEY BREWHOUSE – We’re taking a small break from Stirchley Brewhouse throughout December. It’s all hands on deck in the bakery instead in the run up to Christmas. The smell of seasonal dried fruit & spices is amazing. Brewhouse will be back again in early 2014. Closed 25th December – 1st January. Re-opening on Thursday 2nd January 2014, 2 – 7pm. Next post: Happy Christmas & Thank you!